The Boulder, Colo.-based letter writer who called for “eliminating” oil and natural gas workers and told a media outlet that he “wouldn’t have a problem” with the murder of workers in the oil and natural gas industry now reportedly fears for his own safety and is asking for protection. “The anti-fracking activist from Boulder County who suggested blowing up wells and ‘eliminating’ energy workers is now asking for protection,” Denver TV news station 9News anchor Kyle Clark reported yesterday evening. Andrew J. O’Connor wrote a letter to the editor published in the Daily Camera on April 19 that encouraged Coloradans to act violently against oil and natural gas workers and facilities, asking: “If the oil and gas industry puts fracking wells in our neighborhoods, threatening our lives and our children’s lives, then don’t we have a moral responsibility to blow up wells and eliminate fracking and workers?” The letter was edited the following day, but it still says using violence against the oil and gas industry would be the “intelligent” move for Colorado residents. O’Connor’s comments have triggered enhanced security measures at state meetings concerning oil and natural gas development, including an upcoming meeting regarding a ballot measure O’Connor is pushing that would double state taxes on oil and natural gas production. “The Secretary of State is being ridiculous drama queens,” O’Connor responded in an interview with 9News on Tuesday. 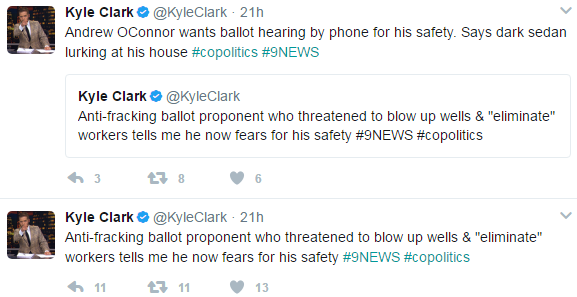 But when 9News reached out to O’Connor again after he told Colorado Politics he “wouldn’t have a problem with a sniper shooting one of the workers” at a well site, O’Connor said he would like for the hearing to be held over the phone instead because of fears for his safety. “When I asked O’Connor on the phone if he really condoned assassinating oil and gas workers, he hung up,” Clark added.